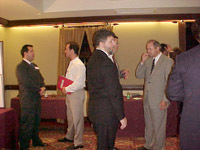 The Inaugural Graduating Class of Entrepreneurs: L-R Michale Periu (POSIP), Tony Gonzalez (Tirenet), Mick Lopez, Bob Larsen (Teebone), Mauricio Lopez (Novitel), Pepe Carreras (NewIdeacenter) in December 2000. 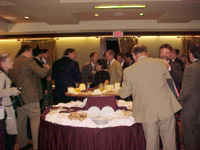 Entrepreneurs and investors share drinks and ideas at the reception after the event. 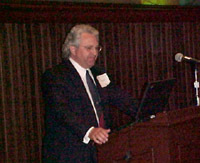 The "state-of-the-art" auditorium at the Biltmore Hotel's Conference Center of the Americas where eFiltro NewIdeaCenter held its investor matchmaking events. Thousands of visitors walked by and many visited the various exhitors at the fair. There was live music and food/drinks. eFiltro sponsored an Elevator Pitch contest that was featured on the radio.